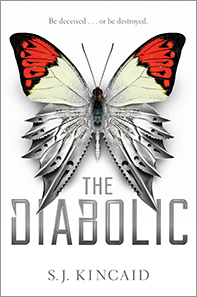 I liked The Diabolic a lot more than I thought I would. I thought it was really original and the main character was so different from any other character I’ve ever read about. It was very well written but I wish there was more world building. I wasn’t able to clearly picture anything and that was kind of disappointing. But I really enjoyed the politics in this book. It reminded me a bit of Game of Thrones and I really liked that aspect of the book. I wasn’t really into the ending. I wish there was a few more chapters or something. Overall, I really liked this book. It was one of best sci-fi books I’ve read in a long time and I can’t wait to check out the author’s other books. If you’re looking for something original and different, I’d recommend picking up The Diabolic.